So this is the third in a three-part series I’ve been working on with Anna Branford and Sally Murphy. I’m not entirely sure what approach the others are going to take to this topic. There are, of course, all sorts of ways of defining ‘recognition’. There’s the formal recognition of awards and the informal recognition of people such as peers and readers and random strangers at the shops. Very early on in the scheme of things, I remember being full of excitement because someone had found my website on purpose, by searching for my name, rather than accidentally, via some variation on “goldfish + ponds” or “hydrocodone”. Once, I was doing laps at the local pool, complete with swimming cap and goggles, when I was stopped, mid-turn, by a lifeguard who wanted to know if I was “that writer-woman in the paper”. These things are all recognition of a sort. But I suspect that in writing about this, at some point each of us will home in on the formal awards, and in some ways it’s a curious alignment that the three of us are doing this blogapalooza together because last year we were all shortlisted alongside one another in the Younger Readers category of the 2011 CBCA Book Awards. Although this wasn’t my first shortlisting, it felt quite different to the others. It felt bigger, as if my work had found its way to a broader stage. My earlier shortlistings – for the 2007 WA Premier’s Book Awards and the 2008 WAYRBAs – felt closer to home, and in a certain sense that was true, as this was back when the WA PBA was only open to West Australian writers. But the CBCA Awards feel like an entirely different beast to me. And I can honestly say that I had never once seen them as something I might be part of. I don’t have a good reason for this, other than, I guess, the fact that none of my three earlier books had been acknowledged by them. Without really actively thinking about the awards – feeling neither anticipation nor disappointment nor much of anything else at all – I think I had somehow decided they had nothing to do with me. Then all of a sudden, Duck for a Day was on the Notables list. Then all of another sudden, it was on the shortlist (because of the time difference, the gap between hearing the news of each was, for me here in WA, very short. By the time I turned my computer on, the Notables list had been up for a couple of hours and so the shortlist followed very soon after). That day, I wrote a post about my response to the shortlisting, the vagaries of judging based on earlier experiences with poetry competitions and so on. I won’t go over that ground again, but the post is here for anyone interested. But that’s a whole other topic which I won’t discuss here, except to make it very clear that I’m not on any level suggesting there is any bias – in the awards or elsewhere. All I’m really suggesting is that until something happens to push your head above the parapet, physical distance does have something to do with psychological distance, and it does matter. I think that being shortlisted put me on the map in a couple of ways. It made people aware of my work in a general sense, and it collapsed the distance somewhat from here to there. I’m hopeful that momentum will carry through to a certain extent. I hope that when people see my name on a book, or in a festival program, they might be more likely to remember it now, to think, “That might be worth a look.” I was very glad to have the recognition for Duck itself, and it opened up some wonderful opportunities for me – not the least of which was Tony Bones’ wonderful musical theatre version of Duck for a Day, which toured during Book Week 2011 – but I guess I’m also hopeful that it will have a broader flow-on effect. When I say that my shortlisting was ‘timely’, that’s what I mean. It’s timely for me now to have had this little kick, to have my name put in front of the industry in a more concrete way. For it to matter, I of course have to keep producing quality work. And I also have to accept that even if I do that, I might never be shortlisted again. As much as I’d like to pretend that I’m philosophical about that, the truth is that now I know that it’s possible that such awards might have something to do with me, I’ll find it impossible not to be hopeful. I am hopeful. I think hope is a good thing, a useful thing, as long as I’m aware that if those hopes don’t come to fruition, it isn’t necessarily a reflection on the quality of my work. And if I feel a bit deflated and need a little ego-boost, I guess I can always console myself with a trip to the local pool. 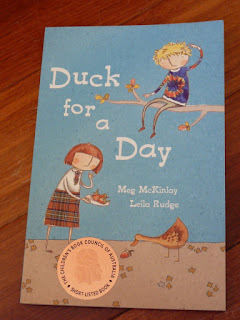 This entry was posted in Awards, CBCA, Duck for a Day and tagged blogapalooza on February 17, 2012 by Meg McKinlay. I wish so very much that I had seen the musical theatre version of Duck for a Day! It must have been so extraordinary to see your story interpreted in such a different medium – and SO exciting. As Born Storytellers 2012 book launch gets nearer, I get communications from my young authors exhibiting all sorts of levels of nerves, because I believe they feel (rightly so, I think) that they are about to be 'recognised' in a way completely foreign to how they normally see themselves. Being 'recognised' by your peers often insists that you accept some of that recognition as a difference that somehow raises the value of your presence and work in the community. Thus recognition requires some management beyond its acknowledgement. The trouble with books like Duck for a Day hitting the shortlist is that you (by 'you' I mean 'me') can no longer race into a bookshop on your way to a kids' birthday party with wrapping paper, scissors and tape at the ready and buy that book you know they will love and won't have read yet. Instead, you (i.e. me) race in to discover that not a single copy of Duck for a Day is left on the shelves—even though you saw 5 there last week—because teacher librarians have gone on a book-buying frenzy the week following the shortlist announcement. And you think PHOOEY and try to be pleased for Meg McKinlay who has written such a good book that your last-minute birthday-gift buying plan is foiled by Evil Teacher Librarians. Enjoyed reading your post, though I don’t know what it feels like to be recognized by complete strangers. I imagine it a mixed bag, but hope to let you know someday…. I can entirely relate to the pleasure of being 'on the radar'. I'd been published in trade and educational titles for many years before my first shortlisting, but my books were not widely known, and in fact many people still refer to Pearl as my first book. A (cheeky) friend explained it to me – that I was an overnight success story ten years in the making. But I'm glad now that I had to wait because the sheer pleasure of suddenly realising that my books were being well received was bliss, and, like you and Anna, I haven't expected these things – they've just happened. Kevin, that's true and there's definitely a level of management. Personally, I can't help but be aware of the element of luck involved in all of this. Yes, you have to be positioned to make the most of the opportunities – I wrote a book, it was good enough to be considered shortlist-worthy, etc. But many people wrote books. Many of them could equally have been on that list. There's nothing about me or that book that has changed in the space before and after the announcement. So as much as I'll of course take the good things that flow from having my work recognised like that, I don't want to let it flow back into my own sense of myself or my work in any way. I think that's a bit of a slippery slope where we end up bouncing too much off the external in order to construct our sense of self. Or possibly I'm overthinking things (it happens). Rebecca, that is quite possibly the nicest anecdote I've ever heard. I just love the image of you running around with scissors/tape etc (have done that on many occasions myself). As much as that wasn't fun for you, I loved hearing about it – thanks! Mirka, I'm really really not in the position of being recognised, which is why those encounters I mentioned were so very odd. I felt like I had slipped sideways into someone else's life for a moment. Sally, I accidentally replied to your 'overnight success' comment over at your blog. All this to-ing and fro-ing must have me confuzzled! I can't imagine how odd it must be to have people think of Pearl as your first book, when you have been so prolific for so many years. It's a curious kind of narcissism, isn't it, to assume that a book is the first simply because it's the first *you've* heard of? In fact, the first thing I do when I come across a book I love is check to see if the author has others, so I can go and devour them all!